First, the C80 board was a bust as far as trying to use it to run the machine. It's opencollector outputs just weren't practical to trigger the drive steps. It's 24v inputs were useful for snooping the output signals from the old control. With that I was able to confirm the step patern is 1/2 step unipolar and even measure the step scale and velocity/acceleration. 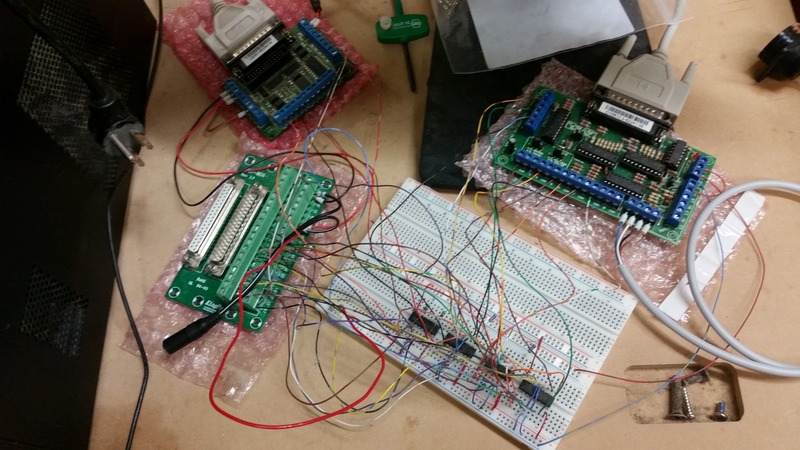 With them I am able to trigger the drive steps using an ordinary 5v breakout board for a parallel port. So far I've tested moving 1 axis with Linuxcnc using a breadboard setup. After I test the full setup, I will solder up something permanent. I can run the machine with full functionality using only pins 1-5,7-11,20,26-30. At this point I do not know what the pins with the question marks were intended for. They don't appear to be used for this application of the Gerber Arc Station. The home switches on this machine (only X and Y) are 5v magnetic reed switches and run off of a separate plug that goes directly to the Arc Station. Last edit: 29 Sep 2018 02:59 by Todd Zuercher. Well I spoke too soon about having it fully functional. I can't seem to command the router motor to turn on/off. I knew the old control put 24v on pin-20, but that by itself is not enough. 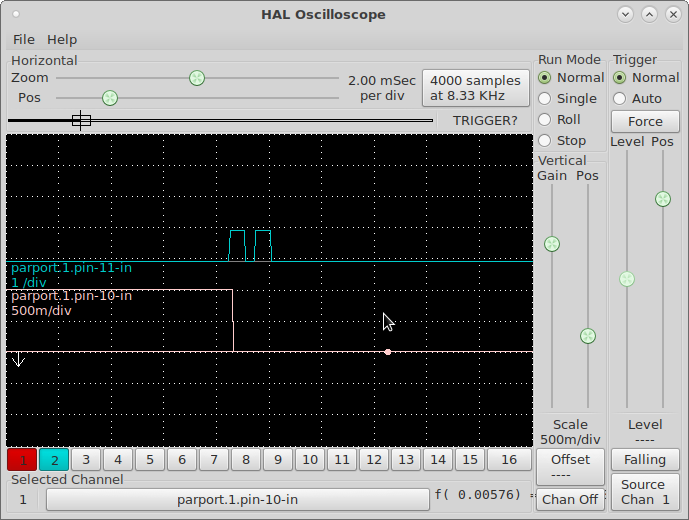 So after careful examination of the boards I went back and checked the signal from the old control on pins 20 and 22 with Halscope. 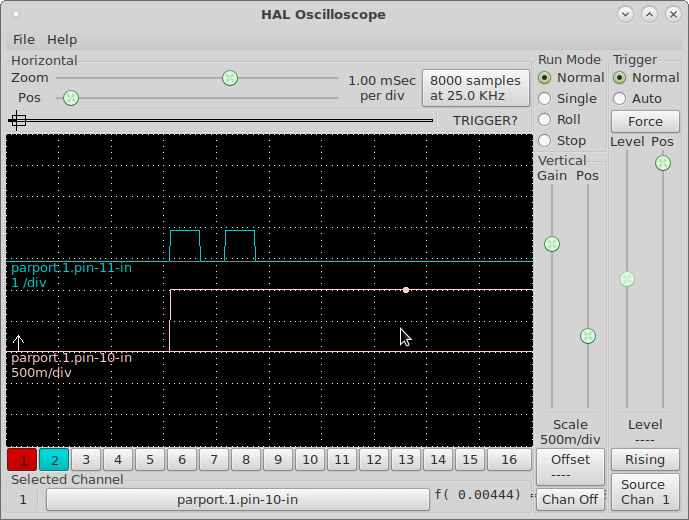 It turns out when pin 20 goes high the control also outputs two short pulses on pin 22. 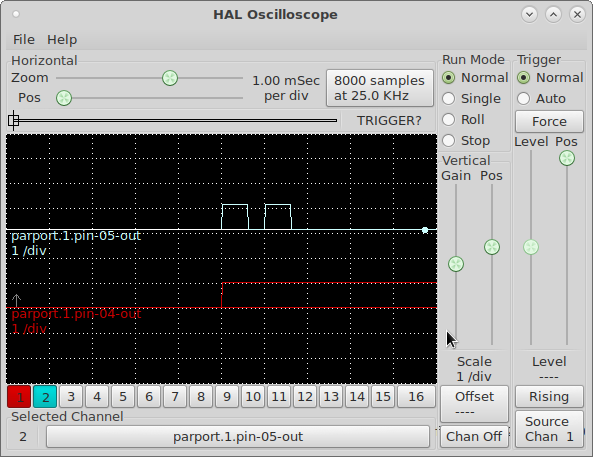 There are also two pulses on pin 22 when pin 20 goes low and the router stops. 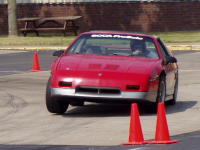 I will post pics of the Halscope traces tomorrow. How would be the easiest way to reproduce that signal? Todd Zuercher wrote: How would be the easiest way to reproduce that signal? So, two oneshots. One triggered directly from whatever rives pin 20, and the other triggered by a timedelay triggered by the same thing. You then need to or2 the two oneshot outputs. Thanks Andy, not sure why I didn't think of timedelay. Here are the Halscope screen shots for anyone interested. I ended up doing it a little differently, rather than using 4 components (2 oneshots, a timedelay and an or2) I did it with 2 edge components, both triggered by both rising and falling edges, the first one triggered by the spindle cmd, the 2nd by the 1st. The 1st edge I set the pulse width to the spacing of the 2 pulses, the 2nd the length of the individual pulses. and here is my result. Now I just need enough time to go test it on the machine and see if it actually works. Here is what my breadboard rat's nest looks like. I also have an old D200 that I stopped using because of ArtPath. Were you able to successfully communicate with the D200 from LinuxCNC and cut a job? If so, how would I go about recreating this project so I can start using my D200 again with LinuxCNC? Yes, I can run our D-200 with Linuxcnc. There are two ways you can approach this. The way I did it, or the easy way. I wanted to retain the ability to run the machine with the old Gerber software, so I needed to retain the old Gerber motor drive. If you won't ever want to run the machine as Gerber intended it would be much simpler, to just replace the old Gerber driver board in the large black box with 3 conventional stepper motor drives. The key to making it work was a set of L239E chips, to convert the 5v TTL signal from the pc breakout board to the 24v signal used in the Gerber drive box to trigger the drive transistors. Here is a copy of my config files. Also, if Gerber's crappy software is the only thing keeping you from using the machine there are a few other CAM software packages that support running these Gerber routers. One I know works is Enroute, It is a bit pricey but it is still cheaper than the garbage Gerber was peddling (last I checked Artpath was still Windows95 tech).